Glee Karaoke for iPhone/iPad has been updated to version 2.0. 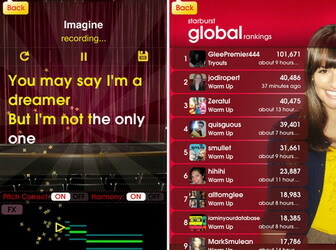 Glee Karaoke lets you sing, compete and share with the world. Glee Karaoke enhances your voice with pitch correction, harmonies, and a little reverb to sweeten the deal. Glee Karaoke gives you real-time feedback so you’ll sound better each time you sing. Starbursts and colorful guides show you how well you are singing so you can improve as you go. + Level up with fun missions and singing challenges. + Compete for high scores on every song, and for overall global stardom. + Improve your singing, and receive feedback right from your audience. + Plus everything you loved from the original Glee app! Glee Karaoke for iPhone/iPad is available for download $0.99 on the App Store in the Music category. 0 comments on "Glee Karaoke 2.0 iPhone/iPad app available for download"